Totally ASUS provided the P8Z77-V Pro/Thunderbolt with eight angled SATA ports which should be enough for any office PC, gaming system or enthusiast build. The Intel Z77 chipset drives the four light blue ports (SATA2 3Gbps) and the two grey ports (SATA3 6Gbps). Last two - dark blue ones - are controlled by an ASMedia ASM1061 chip. There is no debug display which might have been very useful if you should once experience issues with one of the components in your system. You find the EPU and TPU switchs at the bottom board and the MemOK button located at the top right of the board. The audio of the board is powered by a Realtek ALC892 chip. Totally you'll find five fan headers on the P8Z77-V Pro/Thunderbolt which is more than enough to provide a well equipped midrange or high-end-system with fresh air. The fanheaders are located at the top and middle edges of the board. Looking at the external connectors directly at the back-panel ASUS equipped the P8Z77-V Pro/Thunderbolt with four USB 3.0 ports, one gigabit ethernet ports, a PS/2 combo port, an optical out as well as an analogue audio panel. 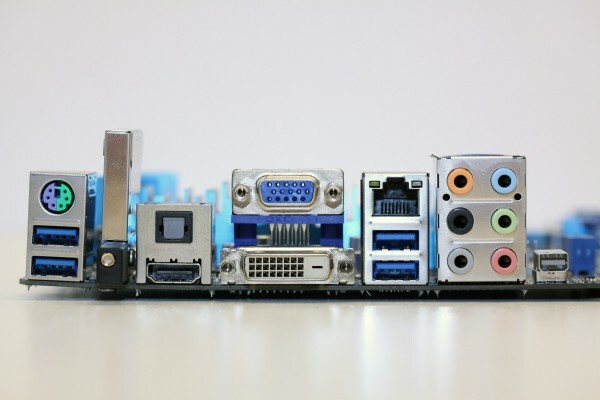 As for the video outputs you get an HDMI, a DVI and a VGA connector. Like the name of the board suggests there is also the new Thunderbolt port.